The need to update websites faster to keep content fresh has been ever growing. Ever since the first business owner wanted their Web designer to update their website faster, content management systems have played an important role on the Web. Why does this matter to you? How do you know if your company is ready. In this article, we will look at how to tell if your organization needs a content management system. We will also give you information on the abilities of content management systems to help you better understand what they can do. While content management systems may seem complex, their entire purpose is to streamline your workflow and make your life easier. A content management system allows you to create, manage, store and edit massive amounts of content without any HTML programming skill. Because you are able to edit your content from any computer with an Internet connection, you no longer have to rely on third-party developers or companies to keep your website up to date. Sounds good, doesn’t it? Every company would like to reduce costs and increase productivity. 1. What Is A Content Management System? If you have never heard the term before, a content management system (CMS) is a Web-based solution that makes it easy for a company to manage website updates internally. For many companies, updating a website is not something to look forward to because it can be a lengthy and, over time, expensive process. Most companies search for easier means of accomplishing their goals. The solution that many large and small companies have found is a CMS. The easy-to-use application allows your company to control its online identity with little to no knowledge of Web design. While you know your business better than anyone else, if you answer Yes to any of the following questions, your company would likely benefit from using a CMS-based website. Does your company update its website content frequently? Does your website contain over 10 pages? Do you constantly outsource simple website updates to third parties? Although building your website with a CMS may not save you money up front, if you need to be able to manage your own content in a timely manner, you will certainly be cutting costs in future. You will increase your organization’s speed while reducing its effort. With a CMS accessible from any computer with an Internet connection, you will speed up the process of approving, publishing, and updating. Some CMS’ have in-page buttons to speed up the process of editing content, while preventing users from accessing the admin interface. Because a CMS has built-in organizational features, content is easier to find and nearly impossible to lose (unless you delete it by accident). You no longer have to spend a lot of time on simple tasks or duplicating your efforts. All of your content is created, managed, published and edited from a single location with very simple, easy-to-use tools. Because using these tools requires very little training, you can start managing your content almost immediately. If you have identified your business goals and recognized that your website will play a role in them, you should begin the process of implementing your own CMS. There is no set list of requirements for a content management system because each organization has unique needs. Keep your requirements to a minimum, but be sure to allow for the future growth and demands of your company. Enlisting the help of a Web design and development company to assess your needs is a good idea. Three key elements that every CMS has, one way or another, are templates, content and meta data. Understanding how these three elements interact with the other CMS features is important: the template is the graphic wrapper of your website; without the actual content, you would have no need for a website; and the often over-looked meta data helps with search engine optimization. 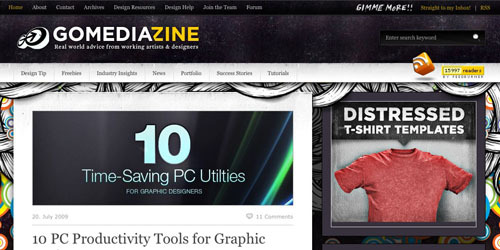 An example of a CMS theme that has the same look and feel on every page. Templates control how your content looks on the page and are extremely helpful when you have to produce a lot of pages (10+). The template is a graphic wrapper that usually looks the same on every page of the website, regardless of the content. It makes your website’s look and feel consistent. When you want to change the template (say, the color or an image), you have to make the change only once and it will be reflected on every page of your website. Popular CMS’ such as WordPress and ExpressionEngine have many free or premium templates available online that can reduce the cost of and help you customize your system. This is the typical layout of a WYSIWYG editor, which has features that are standard in word processors today, such as bolding, italicizing and justifying paragraphs. Content is created, managed and edited independent of all other CMS elements. 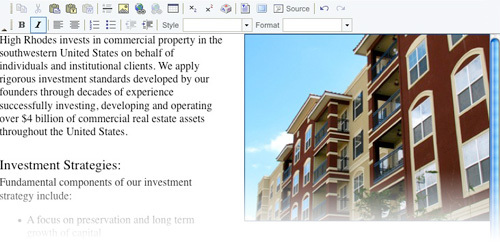 Content could be anything from the text on your “About” page to the photo on your company press release. All content is normally managed through a WYSIWYG editor (what you see is what you get) that has integrated photo uploading tools. This helps you create new pages on your website, manage and edit existing pages and assign pages to multiple areas without having to copy them. Facebook does an excellent job of pulling an external page’s title and description meta data when you post a link to it on a fan page or wall. Meta data plays a key part in search engine optimization (SEO). The great thing about a CMS is that it makes it nearly impossible for you to forget to add this information, thus helping your website’s search and index ranking on search engines such as Google, Yahoo and Bing. Meta data contains such information as category, author, publishing date, title, brief description and keywords. One great use of meta data is for automatically adding a title and description to links posted on social media websites such as Facebook. This not only saves you from having to retype this information but keeps your content relevant as well. This information can also be pulled by search engines and any other website where your website is listed, so make sure to put some thought into writing it. Content management systems come with many standard features to help you create, manage and edit your content. In addition to standard features, additional features can be added to the flexible system framework. These additional features are often referred to as add-on modules or plug-ins. Because a CMS is very flexible, you can use it for a simple website with little content or expand the features to support a complex website with a lot of content. Here is a nice list of high-profile companies that use a CMS for their websites, which will give you a good idea of how far you can expand these systems. These features are what make your content management system so extensive and highly flexible. They allow you to publish, edit and organize content and manage members, and they contain a variety of built-in security features. With these straightforward tools, you can see how easy creating and managing your content is. Publishing is made easy with the in-depth features of a CMS. Without any knowledge of HTML programming, users can create, manage and schedule content with ease. These powerful tools help free up time within an organization by streamlining the whole process. A user can create content, set the category (i.e. the section in which it will be published) and then set it as a draft for later review. Once the content is reviewed, it can be scheduled to be published, say, seven days from then. Once you have reached that step, the rest of the process is automated. You can write and complete a week’s worth of articles ahead of time and take a vacation without having to worry about publishing new content, because it will publish itself (if you have done your part). Typography often causes headaches for writers, especially if the writers are not HTML savvy, but the task is made easier with built-in text editors. With most CMS’, your text can be automatically formatted to produce XHTML-valid typography. This saves you the hassle of hand-coding every piece of content and leaves the “fun” bits to the system itself. If you paste disallowed characters, such as curly quotes, bullets or accents, from text editors like Microsoft Word, they will automatically be converted into an HTML-valid equivalent. Another great feature that many CMS’ include is automatic linking. This feature saves you from having to manually link URLs that you add to your content. All of these features are useful because they make your workflow more efficient when you create a lot of content. And if you prefer to enter your own HTML code every time because you don’t trust the automated process, you have that option as well. Organization is a key part of maintaining a website. With a CMS, all of the content is stored in one place, only once, and is accessible from any location with an Internet connection. Content can be saved in a number of states, such as draft, published and archived. So you can keep unfinished and finished content in separate places, with different attributes. This is especially handy if you like to write content ahead of time and want to be able to easily find it when it comes time to publish. Draft: this is work in progress and is not visible to the public. Published: content that is visible to the public. Archived: previously published content that is tucked away in a safe place, away from the main navigation. Typically used with blogs. Member management helps you control all aspects of your website’s users. As an administrator, you have full control over how many people can access your website and how much control they have themselves. This can be extremely useful for a large company, where many people (author, editor, publisher, etc.) are responsible for creating and maintaining content. You control how many hands are in the cookie jar at each stage of the creation process. Administrator: has complete control over all users and access to all of the website’s administration features. Editor: can publish and mange their own content as well as other people’s content, etc. Author: can publish and manage their own content. Contributor: can write and manage their own content but cannot publish it. Subscriber: can read content, view and write comments, receive newsletters and so on, without being able to edit anything. Build-in security measures give you one less thing to worry about. You no longer have to worry about session management, robots trying multiple passwords to hack your account or losing data when processing forms. Almost every CMS has different session management configurations, so you can set the preferences that fit your security needs. With the built-in “multiple password denial” feature, you can make sure that multiple users cannot access your system simultaneously with the same log-in credentials. In addition, you can automatically lock out users after several incorrect password attempts and allow forms to be submitted only once. This helps prevent loss of data and attempts to hack your system via password. You can integrate add-on modules, or plug-ins, into your CMS to add value, improve accessibility and increase functionality. With the right combination of features, you can create a website that fits your business plan and helps your company achieve its goals. While the number of additional features that you can add is endless, we will focus on the major ones here. GoMediazine is a great example of blog integration. 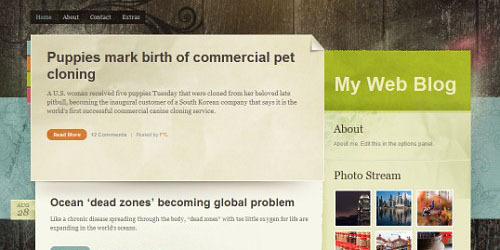 Company blog functionality helps keep your website fresh and can be a very useful marketing tool. While CMS’ have evolved into complete website solutions, they were originally intended to manage blogs. Most blogs were used as personal diaries or breaking news outlets. Adapted to business use, they can be very useful for letting customers and clients know about what’s new and exciting with your company. If you sell products, you can announce new items or sales. Some businesses, such as GoMedia, use their blog purely as a community-building tool to publish educational information. 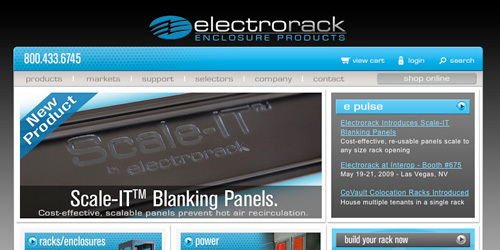 The Electrorack website is a great example of seamless e-commerce integration. E-commerce integration makes the user experience on your website a very comfortable one. Being able to sell products and services from within your website would be ideal for any business. Some companies, including Electrorack, have seamlessly integrated their e-commerce solution into their CMS. The user doesn’t even notice that they are jumping from one platform to another because the look and feel are so consistent. The DesignByHumans website has a great integrated user-based community. Discussion forums are a complete community-building solution that helps your website’s visitors exchange ideas. Users can create topics, offer feedback on existing topics and interact with other users. How you use a discussion forum depends entirely on your needs. 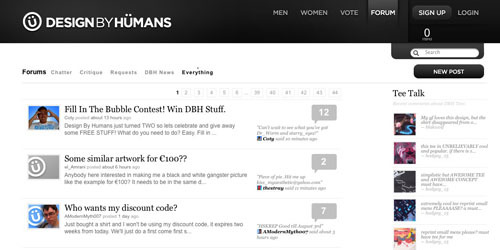 Design by Humans uses its forum to post company news and to let their artists and customers interact for free. This website has a photo gallery set up on its system for album postings. Photo galleries are used by millions of people around the world. Online photo sharing is becoming this era’s scrapbooking. With the increase in social media use, people can easily send everyone they know a link to their latest photo gallery. 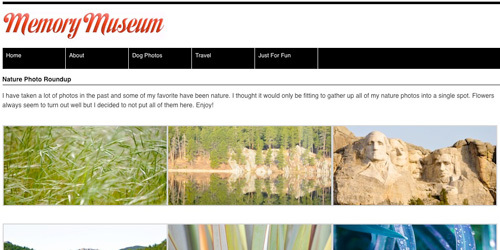 The Memory Museum can display photos easily through the customized gallery on its photography blog. Businesses can use this feature to showcase recent events or feature products. By organizing and displaying photos from within your CMS, you can have all of your content in one location. 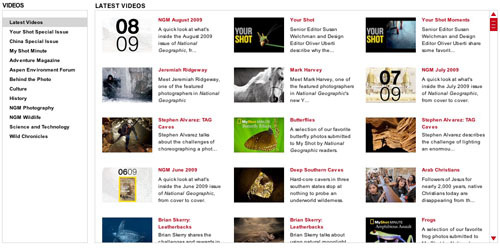 National Geographic has an intuitive integrated video management system to help users view their video content through the Web. Video management helps you organize, edit and distribute video content. You no longer have to upload videos to YouTube or Vimeo and then manage them separately. You can manage your video content just as you manage your website’s pages. You can upload almost any kind of video and then share your albums and videos on your website and on social networks like Facebook, MySpace, Flickr and Digg. CMS’ vary in the video management features they offer. But most let you upload multiple files at once (in batch) and automatically create thumbnails. Once videos are in the system, you can track viewer behavior as well as feature content based on popularity. National Geographic integrates videos into its articles and offers them separately for others to embed on their own websites. Apple offers extensive multi-language support and uses multiple URL extensions to differentiate content. Multi-language support lets you offer content in multiple countries within a single CMS, allowing visitors to choose their preferred language. While most small companies do not need this feature, it can be helpful. The support features may not actually translate content (and if they do, they won’t do an accurate job), but they do let you feature content in multiple languages, which is extremely useful for corporate websites that operate globally. 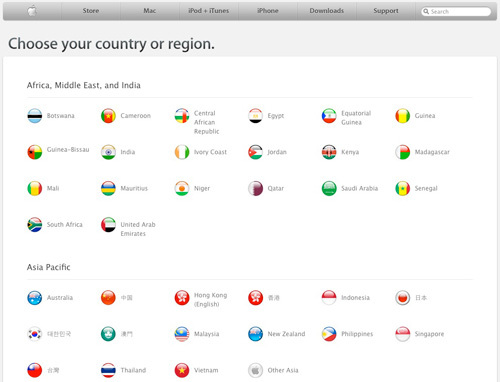 Because Apple operates in many countries, it offers its website in many languages. 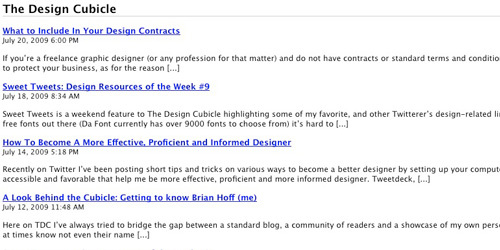 RSS feeds typically show excerpts of content and images (if any), as shown above. RSS feeds are a really simple way to syndicate the content on your website. With the explosion of RSS readers, which constantly check a user’s favorite websites for new content, RSS feeds have become essential. It does not matter whether you update your website daily or monthly, your readers will be sure never to miss an update. Millions of websites publish RSS feeds on a regular basis, and yours should not be an exception. With people’s attention spans shrinking along with their free time, letting users choose the content they want to read through an RSS feed is helpful. A newsletter can be a great way to reach out to users who are interested in your content, especially if yours is designed as well as TV Guide Daily Scoop’s. Newsletters/mailing lists are an extremely helpful feature, especially if you have a lot of users or want to expand your base. Many mainstream users still do not use an RSS reader, and some of them may prefer to receive your content in their inbox rather than by visiting your website every few days. You can integrate newsletters into your system and set the feature’s functionality. Usually, you will be able to manage subscriptions, create a template, compose the newsletter in a WYSIWYG editor, manage your archive and track open/click results. Google Analytics shows detailed information on your website’s visitors, at no charge. 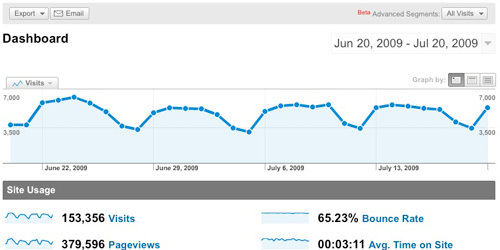 Statistics/tracking is an essential feature for any website. To effectively run and market a website, you need to know as much as possible about your visitors. Analyzing whatever data is available prepares you to achieve company goals, focuses your marketing initiatives and converts visitors into regular users. You will have information on how many people visit your website, where they live, what content they view and much more. Google Analytics is one of the most widely adopted analytics programs that are available for CMS’. Its popularity is partly due to the immense amount of information it provides about your visitors for free. Where Can I Find A Content Management System? You know the size of your organization and how much you can spend on a CMS. These factors are good indicators of where to start your search. Actually finding one can be a daunting task, but if you have a clear idea of what you are looking for, you can quickly weed out the options that don’t fit your needs. Finding a solution that helps your business achieve its goals is important. Many businesses, large and small, use all kinds of different CMS’ to manage their content. Start your journey by using the resources listed below. 45 Incredibly Useful Web Design Checklists and Questionnaires You are much less likely to overlook important aspects of your website if you follow this checklist, which covers content, usability, accessibility, standards and more. 15 Essential Checks Before Launching Your Website Lists some important things to check before taking your website public. 10 Designer’s Checkpoints To Be Aware Of A list of things every designer should know about their website. Compare Multiple CMS Solutions (technical) This is a community service for anyone looking for a means to manage website content. How To Improve Your Branding With Your Content Branding experts speak the truth when they say that a winning brand communicates why you are your prospect’s only solution. If you can’t achieve that, at least convey why you are your prospect’s best solution.